Personal trainers are hired to help their clients reach fitness goals, which might entail anything from losing weight to training for a marathon. Because it is their job to get to know clients and their fitness goals, personal trainers ask a lot of good questions: what is your exercise history? What are your fitness goals? What about your diet? What type of workouts do you enjoy doing the most? 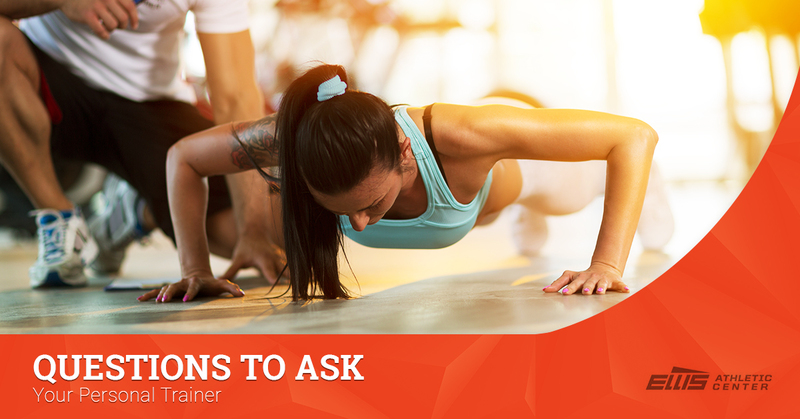 As a client, though, you should absolutely do a role-reversal and ask your personal trainers questions as well. Not only is this a great way to get to know your fitness coach, but also to see if they are the right fit for your exercise needs and personal training goals. Ellis Athletic Center has an excellent personal training staff, and we have compiled the questions we love to hear from our personal training clients. Where did you get certified in personal training? Asking this question is like asking a potential new employee where they received their undergraduate degree — it both establishes legitimacy and tells you something about where this person is from and what their academic interests might be. It’s the same with personal training. You should look for fitness training coaches with NSCA, NASM, or ACSM certifications, as those are highly-respected programs in the fitness world. When you ask your trainer this question, you not only learn that they are highly qualified, but you can also hear more about their passion for fitness. What should I do on my own at the gym? Your personal trainer will have a comprehensive plan for your fitness goals, so they will know what exercises you should focus on outside of personal training sessions. They might recommend more of a focus on core strength and give you the best exercises for abdominal work. They could also suggest that you attend group exercise classes, such as yoga, to improve your flexibility and endurance. No matter what they suggest, you can guarantee that it will be tailored to your specific fitness needs and preferences. What does it mean if I feel X when I do Y? While your personal trainer is a fitness guru, this doesn’t mean they know exactly what is occurring in your body. Your form might look perfect, but you might feel shooting pain in your knee. Similarly, if you feel frustrated doing a certain activity or bored with another exercise, give this feedback to your trainer! They can either tailor your personal training routine so that it keeps you more engaged and, most importantly, safer. Ellis Athletic Center in Newtown Square has a dedicated personal training team here to support you with your fitness goals. We enjoy getting to know our clients, and we look forward to helping you get stronger and healthier. With both 30 and 60-minute fitness training sessions options, a weight loss program, and group training, Ellis Athletic Center can support you. If you want to work with a personal trainer, contact Ellis Athletic Center today for a complimentary session!